Restraints are used for lateral and angular compensators. The restraints absorb axial reaction force produced by inner pressure. Even so, the connected pipe must be equipped with light fixed points to absorb moving force and moments. Precise rating details and operating parameters of the corresponding machinery or equipment must be known to correctly calculate the degree of restraints. Lateral compensators are equipped with adapters for tie rods restraints. The design differs between flanges with welded ears or oval flanges depending on compensator type and size. Tie rods restraints run conical seats. Liners are used to prevent flow induced vibration or erosion caused by abrasive materials. When lateral movement is required in the expansion joint, the flow liner diameter must be reduced to provide clearance. 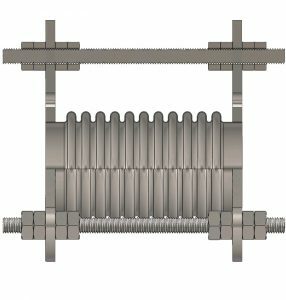 Telescoping liners are used on short expansion joints with large axial movements. When fit close together, they can also be used in systems where the flow can be in either direction.